The birthstone for July is Ruby,the red variety of the mineral Corundum, the second hardest natural mineral known to mankind. 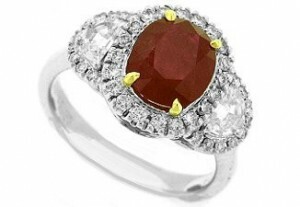 Ruby has been associated with the values of love, success, integrity, passion, and promise. The finest ruby color is vivid, almost pure spectral red as seen in the highest quality Burmese rubies, which are considered the finest. Ruby is also the anniversary gemstone for the 15th and 40th year of marriage. Ancient lore states that the highest quality rubies were said to protect their owners from all kinds of misfortune. There are many who believe a ruby that has not been internally faceted, when worn in jewelry touching the skin will help keep a pregnant women’s unborn baby safe and healthy. NYC Wholesale Diamonds and our Fine Jewelry division stock a complete selection of Ruby and Diamond Rings, Necklaces, Earrings and Tennis Bracelets.